It is so frustrating to see gymnasts landing their Amanars before completing the last half twist and getting credited for it. But in this post, we recall the time judges downgraded a fully rotated Amanar by China's Cheng Fei. 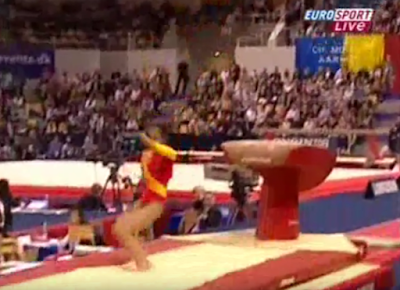 At the team final of the 2006 World championships, Fei competed an Amanar but got credited for a double twisting Yurchenko. An Amanar was worth a 6.5 D score while a double twisting Yurchenko was worth a 5.8 under the 2006 -2008 CoP. While it is not fully rotated in a perfect sense, it was closer to an Amanar than a double twisting Yurchenko or even a two and quarter twist. What do you think? Were the judges picky or not? In the Rio Olympics, we were no longer surprised that female gymnasts are now competing in their second or third Olympics. Eight years ago in Beijing, we were in awe when Oksana Chusovitina vaulted to Olympic silver at the age of 33. We were even more in awe when we knew the reason why she competed for Germany despite being from Uzbekistan. Oksana Chusovitina with son Alisher, now age 17. Many of us will remember that Oksana's ties with Germany strengthen when her son Alisher was struck by leukemia in 2002. 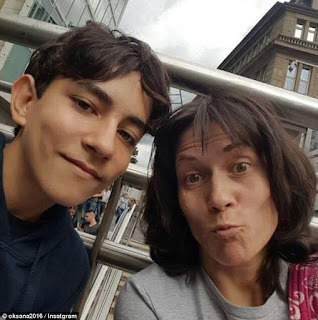 While her home country Uzbekistan was unable to provide the quality treatments Alisher needed, Germany offered her a deal, that she would compete and use the prize money and sponsorship to fund Alisher's treatments. It took six years for the family to fight this tough battle. In the meantime, Oksana vaulted to World gold in 2003, World silver in 2005, World bronze in 2006, Olympic silver in 2008, and many more World Cup and European Championships medals. Eventually, a mother's love conquers all, and a happy ending arrived as Oksana's 2008 Olympic victory sunk in. Alisher was healthy again, and has grown into a handsome young lad. With a son who is older than many of her compatriots, Oksana does not have plans to discontinue her quest of Olympic stardom. Now competing for her motherland Uzbekistan, she (and Dipa Karmakar of India) smashed WAG records by performing the most difficult vault ever performed on Olympic podium recently in the Rio Games at the age of 41. However, Oksana is just one of the handful of gymnasts who competed for foreign countries. In the Rio Olympics, Russian Irina Sazonova and American Kylie Rei Dickson competed for Iceland and Belarus respectively, despite having no previous ties with those countries. Earlier in the history of the sport, Rozalia Galieva of Uzbekistan competed under the Russian flag; and more recently, Russian gymnasts like Anna Pavlova and Yulia Inshina had no choice but to compete for Azerbaijan when the Rodionenkos denied them of an opportunity to represent Russia in international competitions. Due to fewer opportunities to compete at top level in their home countries, these gymnasts, facing controversies and the uncertainties, opted to go against the odds and realise their Olympic dreams as gymnasts of other countries. With this dedication and love for the sport, shouldn't we give them more respect? The brave girls: Yulia Inshina, Irina Sazonova, Kylie Rei Dickson and Anna Pavlova. continued to compete until 1989. We all love Oksana Omelianchik for her adorable smile, but little did we know that behind the seemingly always-smiling face, tragedy struck her in 1986. Fortunately, her loving fans from Japan paid tribute to her with in the most generous way. In the year of 1986, the Chernobyl Nuclear Disaster broke the hearts of many families in Ukraine. Oksana was no exception. Her brother Dmitri (a.k.a. 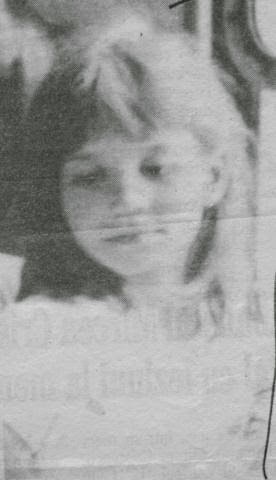 "Dima"), then a first grader, became visually impaired as a consequence. For six and a half years the powerless family looked for help, only to end up in despair. Oksana's mother decided to write to International Magazine corespondent Hiroshi Tsunoda, who made the incident known in Japan. A country well-known for its love of gymnastics and its sympathetic people, donations were made quickly to bring Dima to Japan for medical examination. A month-long medical consultations and discussions were taken place, yet it turned out that limited could be done. Though this might not be the most desirable medical outcome for the Dima, it was a comfort for the family to know that Oksana was well adored and loved by people across the world. If it had not been the generosity of the Japanese fans, Dima might not be able to receive such high level of medical assistance. Indeed, love can travel very far, and lay the foundation for something more meaningful and inspiring. Dima then went on to study in a regular secondary school. 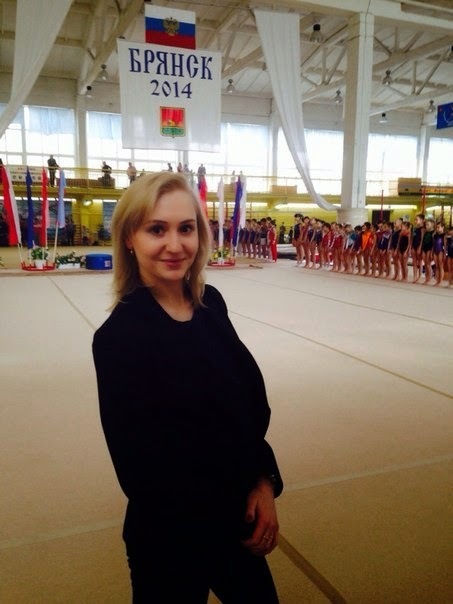 Oksana, now a mother to two adult children, is still hugely involved in gymnastics as an international judge. A three time World Champion in the 1985 Montreal World Championships, her Birdie routine remains as one of the most cherished masterpieces in Women's Artistic Gymnastics. 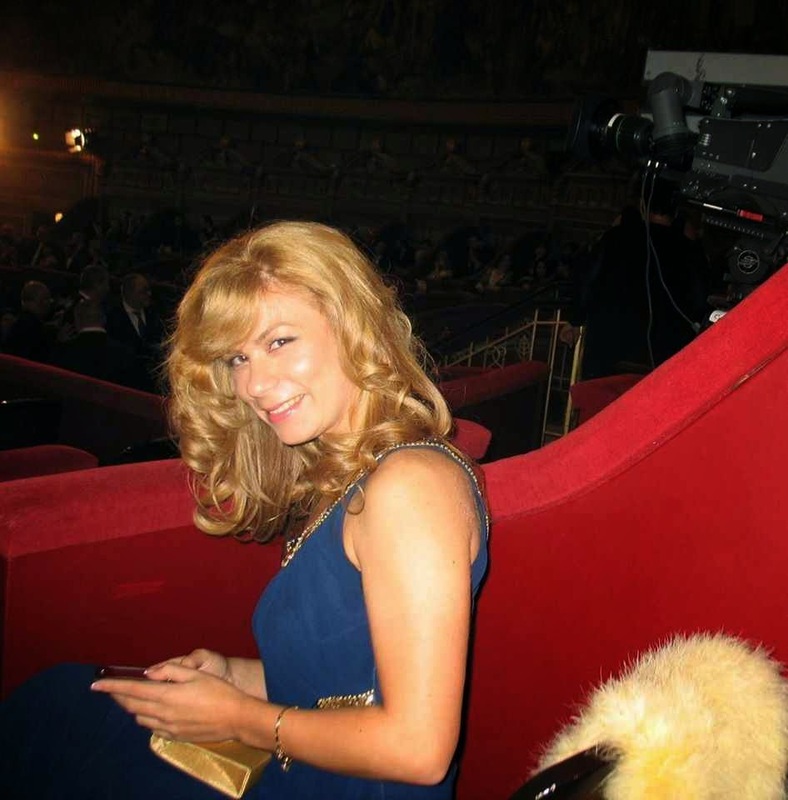 Click HERE to read Oksana's mother's recount of the tragedy. Elodie Lussac was a very promising French gymnast who was born in 1979. At her time, she was France's first female gymnast to compete at an international level. She was admired and considered a national hero. Unfortunately, the talented gymnast fell victim to abuse of her coaches who put an end to what could have been a successful career. Lussac rose to fame when competed at the 1993 junior European championships. There, she won four gold medal including the prestigious all around medal beating Russia's Svetlana Khorkina who went on to be one of the greatest gymnasts of all time. In 1994, Lussac went to the World championships as the two time French national champion. During the podium training, she felt a severe pain in her back. She went to inform her coaches Xuan Lin and Shi Mao about it and tried to tell them she cannot compete and that she has trouble walking. They turned a blind eye and forced her to continue training. They also threatened her that if she pulled out, she will have no chance of going to the Olympic games. She received an anti-inflammatory injections and competed at the competition. After she returned to her home country, Lussac received a diagnosis of severe vertebral compression fractures which had her spent several months in a surgical corset. She felt imprisoned wearing the corset and had fears of spending the rest of her life in a wheel chair. She refused to train with Xuan Lin and Shi Mao and requested to train under Russian Sacha Zaruba but the federation did not accept it since Lin and Mao were the national coaches. She declared war on the federation and filed a lawsuit holding them the responsibility for ending her gymnastics career. The court held the federation responsible for pain Elodie endured following the injury she sustained during the World championships, but not for the injury itself. The former gymnast moved on to medical career. Up until 2008 Beijing Olympic games, Athens was the worst Olympics for the Russian Team. Not only for the Russian men who did not earn a single medal, but also for the Russian women who did not earn a single gold, for the first time in their history. There was a scandal regarding the scoring system. In men's gymnastics' competition, Alexei Nemov got underscored on high bar during the all-around final finishing outside the podium while in women's gymnastics', Svetlana Khorkina was visibly underscored on vault in the all around leading to her second place finish behind US Carly Patterson. The same thing happen during the team final, the Russians felt heavily underscored on uneven bars, beam and vault. “When the competition started and Anna Pavlova received a 9.425 on vault I thought that the judges decided to be stricter in the finals, but then I saw the scores for the American gymnasts and I understood that the scoring system was biased against us” said double Olympic Champion Elena Zamolodchikova. “The judges planned to place us in the fifth or sixth place” believed the Olympic medalist Anna Pavlova. "But our performance without any major mistakes earned us the bronze. We would have won the silver medal hadn’t the judges deducted a tenth in each of our performance." “We had a good execution and I am very pleased with my team’s performance. Our medals were earned fair and square” said Zamolodchikova. “ They are like gold medals to us ” added Ludmila Ezhova. In qualifications the Russian team ended up in 4-th place behind the Chinese team, but mistakes in the final, made the Chinese finish in 7th place. The gold was awarded to the Romanian team while the USA took silver. In individual final, the Russians took a silver in the all around (Svetlana Khorkina) and bronze on vault (Anna Pavlova). While gymnastics is unarguably one of the most beautiful Olympic sports, It is highly common for tragedies to take place. As a little girl Adriana Giurca, who was born in 1982, had a dream to one day become a successful gymnast like her compatriots. Little did she know, her dream would lead to an early end of her life. 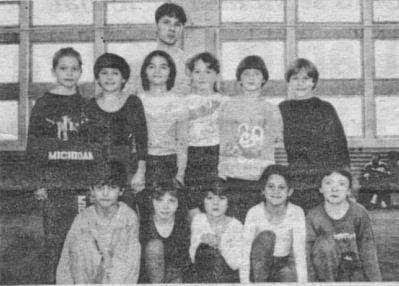 One day in the fall of 1993, 10 year old Giurca went to training at CS Dinamo Bucuresti, the club which has produced many of Romania's great gymnasts, like any other day. Her coach Florin Gheorghe, who was 25 years old at that time, was in a very bad mood that had him not tolerate any kind of failures. Adriana was asked to do a complicated beam routine which she had failed to deliver over and over and over again. Florin grew frustrated and snapped. He grabbed her head and smashed it to the beam several times, he then ordered her to do a difficult floor routine which she again failed to do. He reacted even more violently as he started kicking and punching her, then threw her on the floor where she landed on the padded mats and her spine was pushed to her brain. Adriana never got up and fell in a coma. She was rushed to the hospital where she died two days later. Florin denied physically assaulting the gymnast and claimed that he had only pushed her to the floor where she fell and hit her head. He said that he only did it because he wanted her to be scared of him so she can perfect her skills. "Adriana was a gymnast that was close to my heart, I really cared about her" said Florin who was not arrested immediately. Coaches and gymnasts were scared to speak up. But one gymnast stood up for justice and told the truth which led to Florin's arrest, three months after the incident. Florin was sentenced to eight years in prison, later reduced to six years. He was condemned to pay 12 million lei jointly with Dinamo club, a lot of money back then, as a compensation for Adriana's parents. During trial gymnasts said that they were often subjected to corporal punishment as part of their training. "We accepted the beatings and the pain because we were convinced that this would open the door to top performance for us," a young girl gymnast said during a court hearing. Even Gheorghe testified that he was not the first to hit his students. He singled out then Romania's most famous coach, Bela Karolyi, accusing him of using corporal punishment as a key to success. After Romania's women gymnasts won the world championships in 1995, World's most successful gymnastics coach Octavian Bellu said: "Bulgaria and Russia lost their place in the gymnastics world when they lost their iron discipline." Due to good behavior, Florin left the jail after 3 and a half years. He said in an interview after he was released from prison that he did not think at that time that he was responsible for her death. He also claimed that Adriana's parents, whom he used to have a good relationship with, told him that it was not his fault during the funeral. Only at the trial, the mother called him a criminal and asked for compensation. Florin believes that his punishment was exaggerated and motivated by public opinion. "I don't regret anything but I realize that I paid a price too high because I was honest and correct." said Florin. "In this country, you easily escape all kinds of offences. I have said that I didn't want anything to be covered up and because of that I didn't hire myself a lawyer at first.I preferred to do it alone because I considered myself innocent." "I haven't lied, I haven't beaten or hit gymnasts. I could have said that it was a training accident and got away with it quite easily." He also said that what he did, was nothing compared to the other coaches' practices. Since his arrest, Florin has completely abandoned gymnastics. After his release, he was forced to start his own business in order to pay his bills since no one wanted to hire him. Adriana who was a very promising gymnast, could have possibly been a part of the 2000 gold medal winning Olympic team, had she been alive. Sadly, Adriana was not the first nor the last who suffered from physical and emotional abuse in the gym. US Dominique Moceanu, Romania's Alexandra Marinescu and other gymnasts were outspoken about the physical and emotional assault done by their coaches. Perhaps not all of you, knew that before becoming a double Olympic champion, Russia's Elena Zamolodchikova went through enormous emotional pain as only four months before the Olympics she lost her father. Lena's father was a soldier and in 1986 he was one of the early liquidators who were on site during the Chernobyl accident. Unfortunately he was exposed to excessive doses of radiation which led to worsening health and a devastating diagnosis in 1998: leukemia. Fighting the illness, he promised that he will be alive at the time of the Olympics to see her become an Olympic champion, but God had a different plan. At 7 years old, little Elena told her parents she wants to do gymnastics and started with three training per week. By the time she reached eight years old, she was going to the gym five times a week. Things were getting better and better, until the age of 13 when she went through a hard time and couldn't make herself go to training. She wanted to quit. Neither her mother nor her coach Nadejda Maslenikova who was also her godmother, could make her change her mind. And it was her father who made her return to training “You promised you’ll become a champion” he said. Indeed, she returned back to training to fulfill the promise she made to herself and to her father. Only a few weeks before the European Championship, coach Nadejda found out about the sad news that Elena’s father had died. That day, she let Lena finish her training first and then approached her: “You know Lena…”, but Lena had already felt it and said “I know… can you imagine this…” She didn’t want her teammates to see her crying and went to the park that day and cried alone. The next day she came to the training as if nothing had happen. During the Olympics in Sydney, Lena went through good and bad moments. The first days seemed to be a continuous chain of bad luck: she didn’t qualify neither for the all-around final due to 3 per country rule, nor for the vault finals where she finished 9th. Then,during team finals she along with her teammate Yecaterina Lobazniuk fell during their balance beam routines which cost what could have been their first Olympic gold medal. Nonetheless, she was given a chance in the AA final. Her teammate Elena Produnova offered her, her place. Elena was performing well up until she went on floor exercise and had a fall on her easiest tumbling pass. Hadn’t it been for that mistake she would have become the All-around Olympic champion. Unfortunately, she finished in sixth position. It was the event finals that brought her the immense joy of fulfilling her promise. In the vault final, she was given a second chance to prove herself where teammate Svetlana Khorkina gave up her spot for her. And she didn't just win a medal, she became the Olympic champion on this event. And the moments of glory did not end here. In the floor final, she performed her difficult routine perfectly and outscored all of her competitors and became a double Olympic Champion, fulfilling the promise she made to her father. With a successful gymnastics career, comes great pain. Legendary gymnast Nadia Comenci had to endure so much pain in order to secure a gold medal for her team. A lot was expected from the Romanian gymnast at the 1979 World championships, but a bouts of flu had left her weak and thin. There, she led the field after the compulsory competition, but on bars, she got a scratch on her wrist from her metal grip buckle which caused blood poisoning. Nadia who was hospitalized as a result, was ordered by the doctors to not continue competing at the competition. As such, she was not scheduled to compete. But when teammate Emilia Eberle fell on balance beam, badly injured Comaneci was called to compete on beam as the team needed a good performance from her in order to secure gold. Comaneci had to perform a one armed routine on the apparatus while suffering from excruciating pain. Her routine consisted of a front aerial, side aerial and back tuck. She only used her injured hand on the back walkover and the pre dismount round off. The Romanians indeed benefited from Comaneci's collaboration. Her routine scored a 9.950, leading her team to their first ever World gold medal. Subsequently, Nadia had to spend several day in All Saints Hospital so she can recover and underwent a minor surgical procedure for the infected hand, which had developed an abscess. The World champion who was obviously happy with the gold, wrote in her autobiography that when she coaches, she will never expect from any of her girls to jeopardize her health in such a way. There was much criticism as to whether Nadia was forced to jeopardize her own well-being for the team, or was it of her own free will. At that year, Comaneci became the first female or male gymnast to win three European all around titles. Elite sport requires sacrifices, hard work, talent and sometimes putting our health at risk. Romania’s Silvia Stroescu was a part of the 2004 Olympic gold winning team, 2001 World gold winning team and 2004 European gold winning team. Her success comes after years of hard work and what most of us didn’t know, putting her health at risk. In one of her interviews for the Romanian show “Teo” she talked about what did it take to make the Olympic team. A slipped disc is a very serious injury that could permanently affect the spine. Patients may experience serious pain depending on the gravity of the situation. Silvia fought and kept pushing forward in order to realize her dream. As her condition was a serious one and could have badly affected her health, Silvia has to sign a written agreement where she takes full responsibility for her decision in continuing gymnastics knowing about the health risks. Does That Mean China Was Unfairly Stripped Of Their Olympic Medal? Dong Fangxiao’s mother gave an interview some years ago and offered some interesting perspectives regarding the age falsification her daughter was involved in. Her mother also mentioned that athletes have to pass a bone age test in order to compete. “Fangxiao has (her age on) her identity card and other supportive documents also,” she said. In fact, Dong Fangxiao’s began developing leg pains since 1998, when she became one of the key members for the national team. She had been receiving painkilling injections since that year. Nevertheless, she continued her training since the team did not realize it could be a huge injury. It was later revealed in 2001 that she suffered terminal stage necrosis at her left femor due to over training. At that time, her leg was swollen and she could not walk properly.After retirement, she had received 8 surgeries. She then went on to learn French and became a judge at international level. Before her Olympic medal was stripped off, she was studying in New Zealand with her boyfriend, and coached children’s gymnastics part-time. After the 2008 Beijing Olympics, she was discovered that her age in the official profile did not match her competing age during the 2000 Sydney Olympics. To make matter worse, her provincial team coach died at the same time, and her hopes of getting a job at her provincial team vanished. She could only work as a part-time for a low income. According her mother, there was “no one backing her up”. Regarding the age scandal, the Chinese National Team released a statement that “Age Falsification is an individual problem.” Dong Fangxiao has yet to give her opinion on this issue. When the great Svetlana Khorkina retired after the 2004 Olympics and the code of points changed, it was time for the new generation of gymnasts to try to deliver the performance once Russia was known for in gymnastics. As a junior, Yulia Lozhechko was a very promising gymnast. At the 2004 European Junior championships she won gold with her team, silver on the balance beam and a bronze in the all around. In 2005, Yulia turned senior, she competed at European championships where she won a bronze medal in the all around and at World championships where she placed 7th due to a fall. Lozhechko hit her peak in 2007 and became a European beam champion. At that year she went to the World championship where a controversy started over her behavior. During the qualification Yulia changed her balance beam dismount to a double Arabian instead of an easy double back on the spur of the moment in order to have a higher D score. Nonetheless she fell and didn’t qualify for the event final. Because of this incident Lozhechko was banned from the national training center in Round Lake as a disciplinary sanction. The national head coach Andrei Rodionenko stated she doesn’t deserve to train with the team and has to follow her own program with her personal coach until the end of the year. It is noteworthy that the fault of Kramarenko who balked on her vault attempt and scored a zero thus dropping the team from bronze medal position to disappointing 8th place, was taken much easier than what Lozhechko did. This type of sanction was applied for Maxim Deveatovski in the same period, and earlier to Nikolay Kriukov and Anna Pavlova. Yulia wasn’t selected to the 2008 European team. The federation claimed she is not in shape. Although she was included in the squad for 2008 Olympic Games , she wasn’t selected to be a part of the team. The reasons were vague “Sadly, she doesn’t match our standards ” declared Rodionenko. Not being chosen to go to the Olympics caused the gymnast serious psychological problems. After 2008 she quilted elite gymnastics, however she participated at the Universiade in 2011 where she won bronze in the team finals.